Some correction in gold rate was witnessed despite auspicious buying during Dhanteras. Spot gold was trading at Rs 29,708 per 10 grams with a loss of 0.54% in Ahmedabad at the Multi-Commodity Exchange. Gold price was subdued today even on the auspicious occasion of Dhanteras 2017 due to negative global cues. Spot gold closed Rs 140 lower at at Rs 30,710 per 10 grams due to a weak trend overseas even as the metal witnessed token buying by retailers and jewellers on auspicious 'Dhanteras'. In New Delhi, gold of 99.9 and 99.5 per cent purity fell by Rs 140 each to Rs 30,710 and Rs 30,560 per ten gram, respectively. In futures trading at the MCX, gold for delivery in December too was down by Rs 104, or 0.35 per cent at Rs 29,750 per ten gram. Analysts said that apart from profit-booking by speculators at existing levels, fresh weakness in gold rate overseas weighed on gold futures. Experts are not very hopeful of an uptick in gold demand during Diwali. "Even this Diwali, we will see gold buying like every year but nothing overwhelming that significantly lifts demand. This again, in a way, is a reflection that India continues to remain a price taker and global macros continue to set the price of gold. Given that the dollar index has appreciated over the past two days, some correction in gold prices is being seen despite auspicious buying during Dhanteras," said Chirag Mehta, Senior fund Manager, Alternative Investments, Quantum Mutual Fund. Silver also recorded a fall of Rs 400 to Rs 41,000 per kg even as retailers made token buying in coins. Silver ready also dropped by Rs 400 to Rs 41,000 per kg, while weekly-based delivery was down Rs 490 at Rs 39,990 per kg. Globally, gold fell 0.45 per cent to trade at $1,288.70 an ounce in Singapore, while silver shed 0.64 per cent to $17.09 an ounce. Meanwhile, Finance Minister Arun Jaitley today launched gold options trading on MCX and said this is one of the steps towards formalising gold trade. 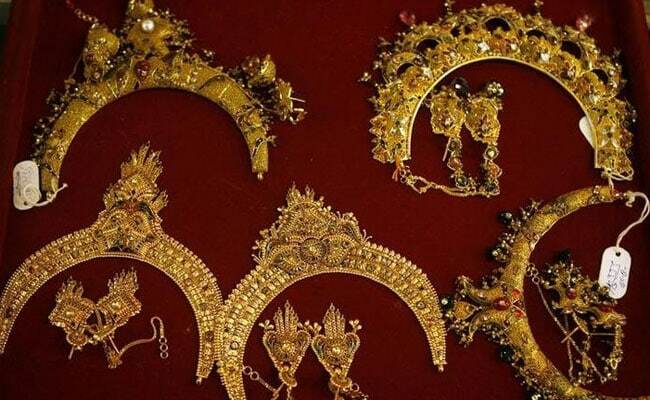 After the success of the gold options, MCX said it will approach the regulator Sebi (Securities and Exchange Board of India) seeking permission for other commodities like cotton, crude palm oil, silver and copper.